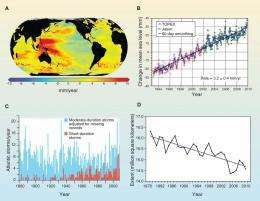 (PhysOrg.com) -- The first comprehensive synthesis on the effects of climate change on the world’s oceans has found they are now changing at a rate not seen for several million years. In an article published today in Science magazine, scientists reveal the growing atmospheric concentrations of man-made greenhouse gases are driving irreversible and dramatic changes to the way the ocean functions, with potentially dire impacts for hundreds of millions of people across the planet. The findings of the report, “The impact of climate change on the world’s marine ecosystems” emerged from a synthesis of recent research on the world’s oceans, carried out by two of the world’s leading marine scientists, one from The University of Queensland in Australia, and one from The University of North Carolina at Chapel Hill, in the USA. Professor Ove Hoegh-Guldberg, lead author of the report and Director of The University of Queensland’s Global Change Institute, says the findings have enormous implications for mankind, particularly if the trend continues. He said that the Earth's ocean, which produces half of the oxygen we breathe and absorbs 30% of human-generated CO2, is equivalent to its heart and lungs. “Quite plainly, the Earth cannot do without its ocean," he said. "This study, however, shows worrying signs of ill health. Professor Hoegh-Guldberg said: “We are entering a period in which the very ocean services upon which humanity depends are undergoing massive change and in some cases beginning to fail. He said that we may soon see “sudden, unexpected changes that have serious ramifications for the overall well-being of humans,” including the capacity of the planet to support people. The “fundamental and comprehensive” changes to marine life identified in the report include rapidly warming and acidifying oceans, changes in water circulation and expansion of dead zones within the ocean depths. Report co-author, Dr John F. Bruno, an Associate Professor at The University of North Carolina, said greenhouse gas emissions were modifying many physical and geochemical aspects of the planet’s oceans, in ways “unprecedented in nearly a million years”. “This is causing fundamental and comprehensive changes to the way marine ecosystems function,” Dr Bruno said. In their study, the researchers sought to address a gap in previous studies that have often overlooked the affects of climate change on marine ecosystems, due to the fact that they are complex and can be logistically difficult to study. Renowned coral reef scientist and former chief scientist at the Australian Institute of Marine Sciences, John “Charlie” Veron, says studies of coral reefs have previously dominated investigations into climate change impacts on marine environments, giving rise to the impression that this is simply a “reef problem”. “This paper gives a refreshingly holistic approach to this subject where reefs have no more profile than other marine ecosystems: the subject is bigger than reefs,” Dr Veron said. *We are already in the middle of it buddy, well, at least towards the end of the beginning. Apparently some people think it is. Goes for all science I guess. Astronomy conflicts with religion, ignore astronomy. Climate science conflicts with immediate profit margins, ignore climate scientists. Supress the science and divert the issue, now its about "our dependance on foreign oil" rather than the obvious larger issues of climate change and sky rocketing cancer rates (the previously argument also gives them a chance to drill here, perhaps the gulf of mexico is a good place to look, lol). Excuse me, but what else you expect from "Global Change Institute"? If they were to publish "nothing have changed, really" wouldn't they have shoot themselves in the foot? In related news antarctic sea ice cover increased beyond the standard deviation. With this rate sometime around the year 2300 it would cover the entire ocean surface of the globe! Try to follow along with the rest of the class. why don't YOU do your homework? The article you quote is pure rubbish. toyo: Did you happen to notice that the web page you are pointing to was written in August of 2002? There has been a lot of refinement and better understanding since then. You are partially correct. The Antarctic sea ice has shown a slight increase while the Arctic sea ice has shown a large decline. If you look carefully at the reasons (mostly developed since 2002) you will find that the arctic and antarctic are expected to respond differently because of their very different composition (arctic is mostly ocean surrounded by land and the antarctic is mostly land surrounded by ocean). The idea is that both regions are important indicators and can't be taken in isolation. You should pull out more recent references if you don't want to be misconstrued as disingenuous. NASA and NSIDC have some great information on the cryosphere (that even supports some of what you are saying but not the idea that what Caliban was saying is rubbish).